BT today announced the launch of BT One Collaborate Spark, a new business collaboration service that allows teams to work together more intuitively and productively regardless of location and device used. The new service brings together the collaboration tools offered by Cisco Spark with the voice services of the BT One Cloud Cisco platform. Cisco Spark is a hosted collaboration application, providing team messaging, online meetings, voice and video calling and interactive drawing. The service uses end-to-end encryption for added security and is provided on a subscription basis with customers paying per-user-per-month. This allows services to be added on demand. It is accessed via an app on desktop and mobile devices. On iOS, the service is available as a native application, meaning that calls are automatically routed via Spark rather than the public network. It can also be used on specialist desktop and room-based collaboration devices. The combination of Cisco Spark with the BT One Cloud Cisco platform’s voice services helps customers reduce costs by automatically routing calls via the One Cloud network, avoiding or reducing international call charges — to the delight of their finance teams. It also gives users a more seamless unified communications experience. 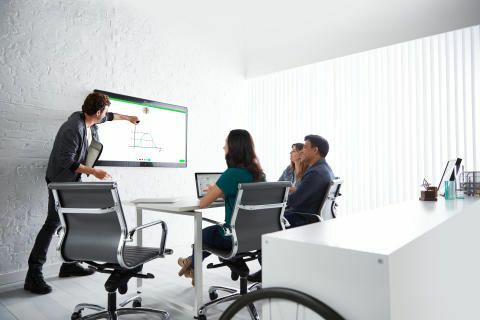 BT also offers the option of using Cisco Spark Board, a powerful new business collaboration device fully integrated into the One Cloud Collaborate Spark service. Spark Board is available at launch as a 55 inch presentation screen that also acts as a digital whiteboard and video conferencing tool. Spark Board performs a number of functions that enrich users’ collaboration experience. It automatically detects Spark-enabled devices, enabling users to seamlessly switch between mobile and room-based collaboration. A 70 inch version of the device will be available later in the year. One Cloud Collaborate Spark adds an ad-hoc, project or team-based communication and business messaging tool to the extensive portfolio of BT One collaboration services. As well as allowing calls to be made externally to users not on the Spark cloud, One Cloud Collaborate Spark enables customers’ employees to initiate, answer or transfer calls to anyone in the company directory. Its messaging functions allow employees to easily message contacts directly or in a group chat, share content, or set up virtual meetings with audio, web, and video conferencing capabilities. The new service is being launched initially in the UK and US with a global roll-out to follow.